2016 ended with mortgage rates much higher than they began the year. While last week was a tame week for rates, the last two months have been brutal. Rates climbed at a rate not seen in many, many years. Optimism for a change in Washington appears to have been the primary driver, along with continued slow economic growth. Consumer Confidence climbed to a monthly reading not seen since 2001. So far, the increase in mortgage rates has crimped refinance activity, as expected, but home sales continue to post solid gains. If historical trends play out, we may see rates flatten as we head into the New Year. 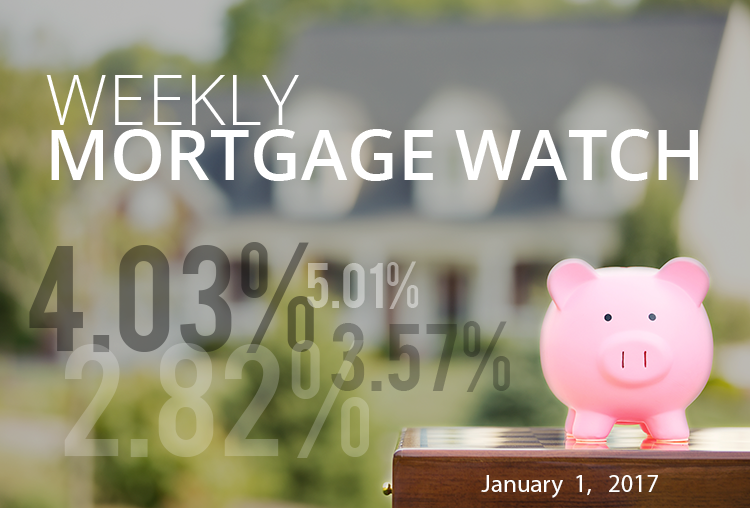 Given the propensity of things not to move quickly in Washington and the fact that economic growth is not spiking, we could see rates flattening or drifting downward for a while. This week starts with some extremely important economic data in the form of the ISM indices and the Employment data. If these reports come in near expectations, which is mostly flat, then mortgage rates could move downward. However, better-than-expected data could spike rates once again. THE GROWING HOME OFFICE PARADOX? Over the last decade, the number of people working from home has steadily increased. Technology has untethered us. As the trend began, the home office exploded in popularity as people eliminated their commutes and worked from home. However, according to Zillow, real estate listings mentioning home offices have declined 20%. Even builders are dropping home offices. Buyers are now favoring more open spaces, as the need for a dedicated office appears to be dwindling.